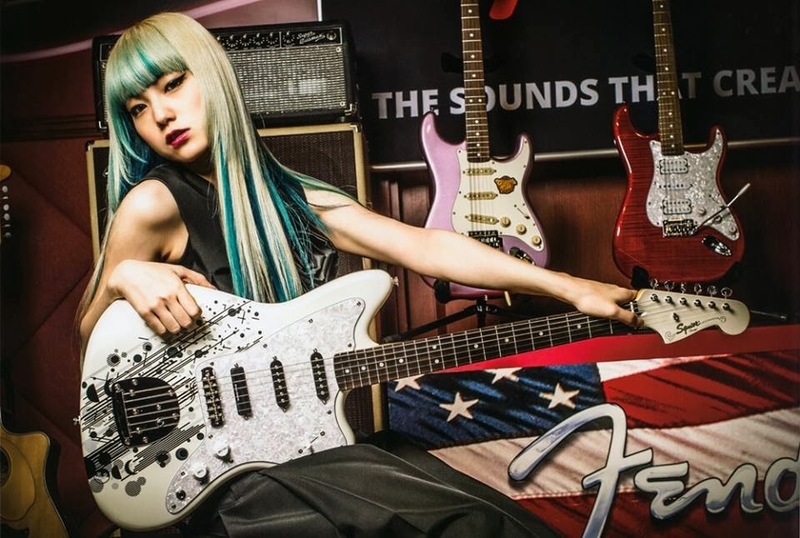 In 2012, SCANDAL debuted special one-off custom Squier guitars at their show at Budokan. I was there, and I got to see them play these for the first time in person. It was obviously the start of a new marketing deal of some kind with the Fender sub-brand, but two years on now it had seemed like that was all it really was. But now they're all really being released as SCANDAL signature models in "early summer 2014", at an MSRP of ¥60,000 (about $600) each. Street price should be less than that. 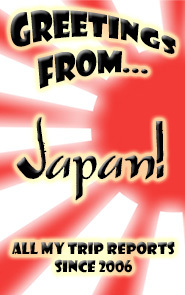 Only available in Japan, but no doubt you'll be able to import them from places like Ishibashi Music. This is... kind of a big deal! I hope to get all three (update: I did - click the link and scroll down). Yes, I'm at least planning to spend ~$1,500 on three Squier guitars. Nobody had better ever question my fanboy credentials when it comes to this band! 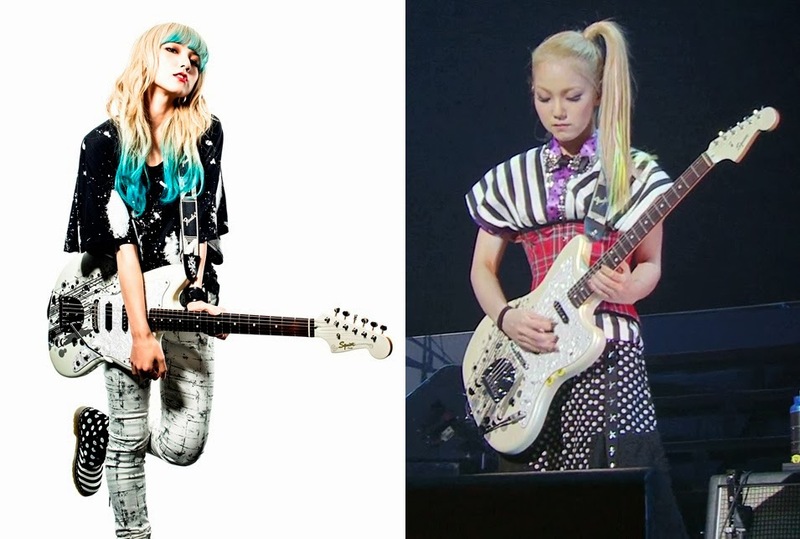 Production guitar on the left, prototype she actually plays on the right. 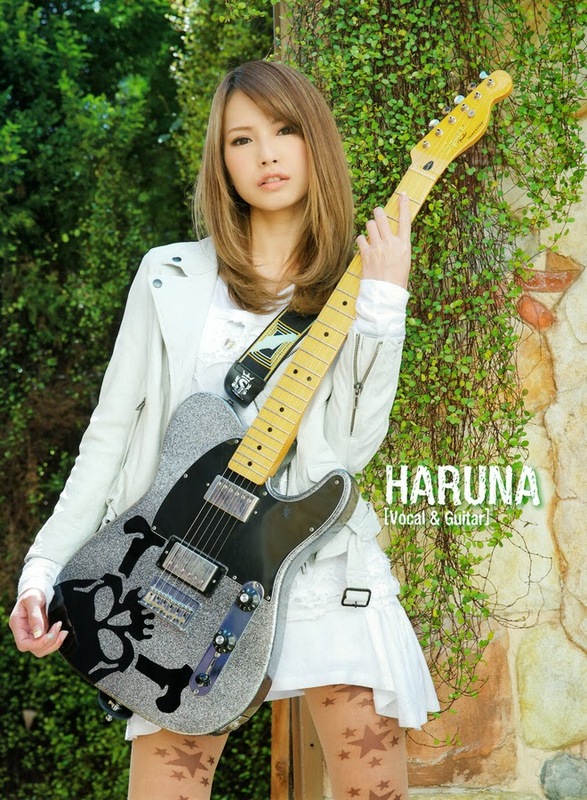 Haruna's guitar actually has a pretty incredible sparkle finish, with big metal flakes in it that really shine in the light. It's hard to really tell from just a couple pics but the production model does look a little duller and more gray, with smaller flakes. That would actually make sense, because bigger flakes take different equipment and more skill to get right. 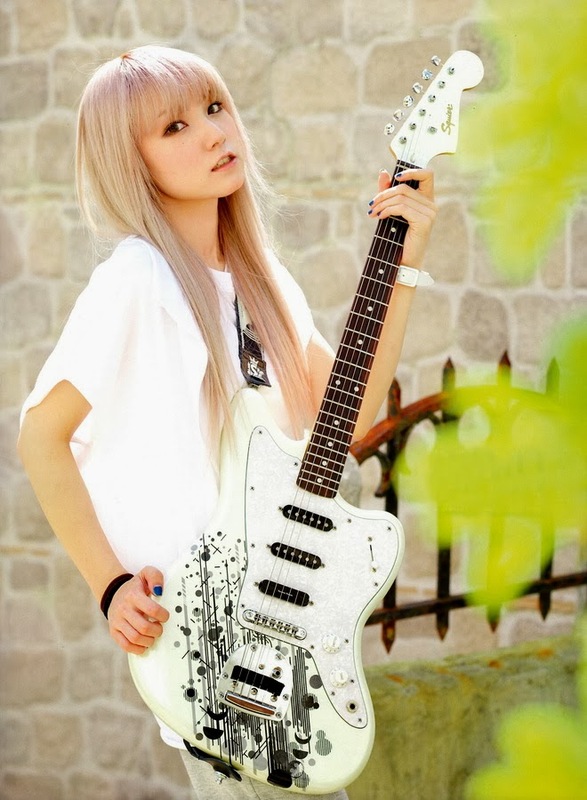 I never thought they'd come close to matching her amazing sparkle finish in a production Squier guitar. I give them credit for even trying. The prototype is not really like any current production Squier Tele, but it is somewhat close to the Fender Blacktop Telecaster. I've seen some people online speculate that a Blacktop is what her guitar really is, but her Tele has a 21 fret neck so it's obviously a custom guitar at least as far as that goes. The production Squier model may be based on a Blacktop body with a different neck as well. This is interesting because Mami actually posed with what I now suspect is a production Stratomaster for her Go! Go! Guitar! special issue - that guitar had a different headstock decal and bridge than the one she actually plays. This production Stratomaster seems to basically be a Vintage Modified Jazzmaster with a pearloid pickguard, new paint job, different pickups and a Strat switch, whereas hers is also routed for an Adjust-o-Matic bridge. 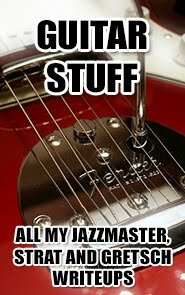 (I actually prefer the original Jazzmaster bridge, but she obviously doesn't, so this isn't really true to her desires.) I'm really curious to see how the body is actually routed in the production model. I do think this guitar is technically the most interesting of the three, because it's the most unlike any current guitar on the market. It's almost like a Pawn Shop model. 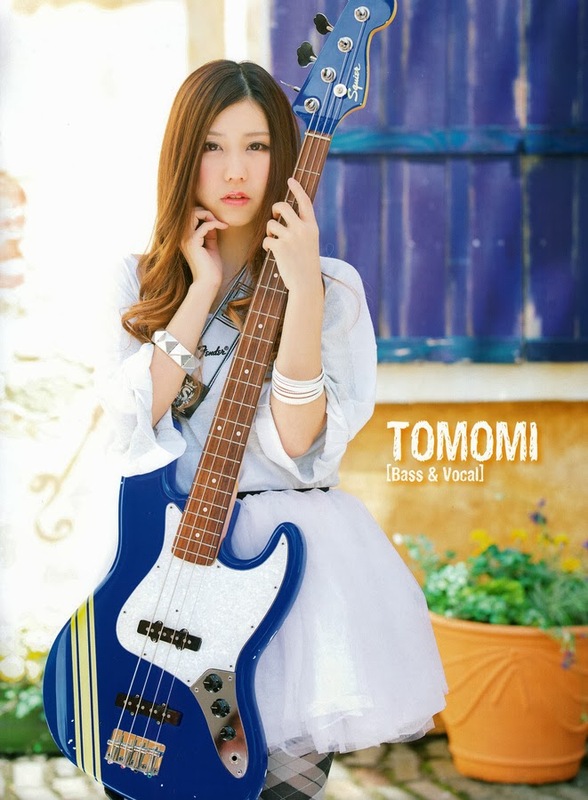 Tomomi's production bass is probably the closest to the original and the most like a current production model. It's basically a standard Jazz Bass with a sky blue color (not too hard to duplicate) and a competition stripe. The headstock decal appears different - her real one just says "Squier" (like Mami's Stratomaster), while it looks like the production version says "Squier Jazz Bass". One interesting thing I just noticed is that the string tree on her prototype bass is positioned slightly differently than on the production model. Hers is somewhat below the second tuning peg, whereas the production model has it almost in line with it. 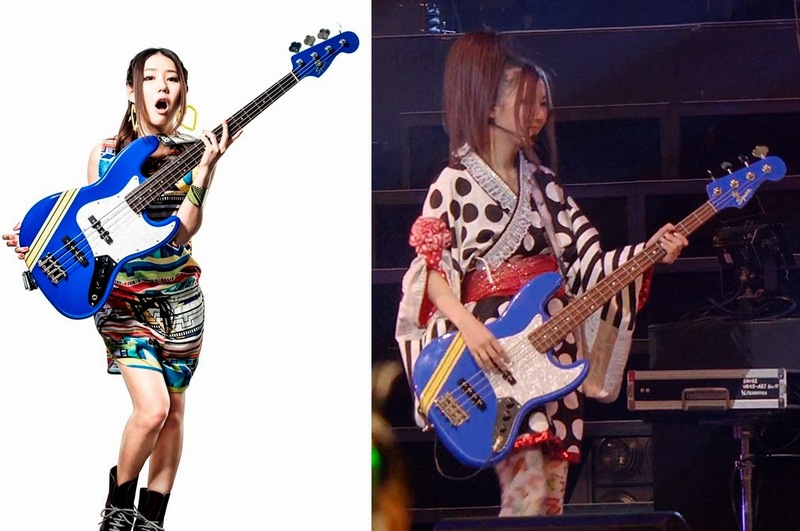 Like Mami's guitar, this makes me believe the production model is actually a Squier Vintage Modified Jazz Bass with different knobs (it has all the same features and the string tree in that position), whereas the original bass is... something else, but definitely not a Squier Vintage Modified! I believe her original bass is really a Fender American Standard body with a Modern Player neck. 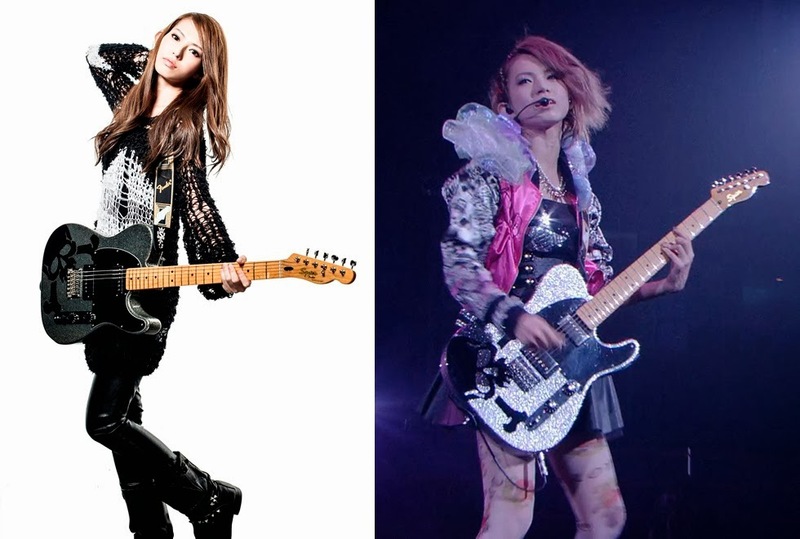 There are probably other differences that we can't see - I'm sure their actual guitars have fully upgraded electronics. They're not playing big arenas with no shielding, plastic wiring and tiny little pots. My guess is that they've got top quality stuff in their prototypes, and these production Squiers will be... well, Squiers. But damn, they look cool, and it'll be fun playing them. And it's a way to keep the memory of that night at Budokan fresh forever. Second and lastly, these guitars are being re-released in March of 2016, so if you missed out the first time, you have another chance.